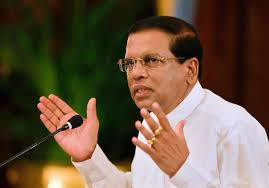 President Maithripala Sirisena yesterday said that "irresponsible stories" published by news websites and social media have given a wrong impression to Sri Lankan expatriates as well as to the international community. He said the government is not trying to divide the country or remove army camps from the North. Claims by these websites that the government is planning to neutralize or weaken the army are also totally baseless. President Sirisena was speaking to Malaysia’s Chief Sangha Nayaka and Chief Incumbent of the Buddhist Maha Vihara at Bricksfield in Kuala Lumpur, Ven. Kirinde Dhammarathana thera during his three-day official visit to Malaysia. The President’s delegation included Deputy Minister of Foreign Employment, Manusha Nanayakkara, Deputy Minister of Internal Affairs, Wayamba Development and Cultural Affairs, Palitha Thewarapperuma and former Colombo Mayor, A. H. M. Muzammil. Sri Lankan High Commissioner in Malaysia, Ibrahim Ansar was also present. "Websites and social media propagate baseless stories about our country, which mislead Sri Lankans living overseas who read them to keep themselves updated on developments in their motherland", President Sirisena said, adding they have no other source to know about what’s happening in Sri Lanka. He assured that the government’s endeavor is to take the country forward through a development drive after the war and consolidate democracy and reconciliation. These websites don’t give publicity to the real policies and genuine intentions of the government. Commenting on protests organized by a group of Tamils in Malaysia against Sri Lanka during his official visit, Sirisena said a small group of people who have personal agendas organized the protest. "Around 10 to 15 people staged a demonstration against us as they use to earn money by organizing such protests," he said adding they were paid in dollars. Sirisena signed the Guests’ Book after the discussion with the Chief Incumbent and Ven. Dhammarathana thera presented a memento to the President. The President visited Malaysia on an invitation by the Malaysian government. He presided at the launch of the Sri Lanka – Malaysia Business Forum on Thursday and held bilateral talks with Malaysian Prime Minister Najib Abdul Razak the following day. Five agreements were signed on further developing the areas of foreign employment, youth activities, tourism, agriculture, culture and arts during the President’s visit.